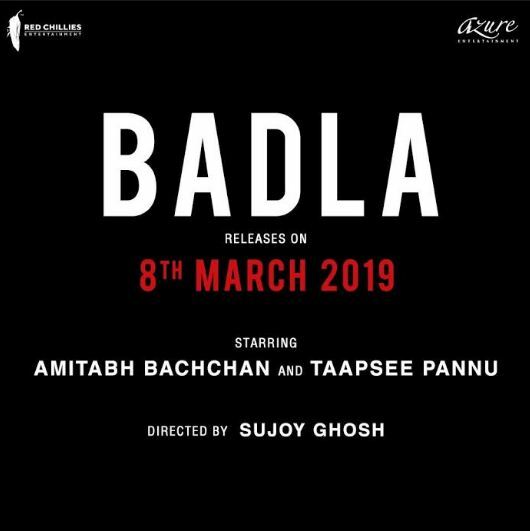 Amitabh Bachchan and Taapsee Pannu starrer and Sujoy Ghosh directed Thriller, BADLA is all set to hit the big screens on March 8, 2019. The Film is produced by Red Chillies Entertainment and Sunir Kheterpal & Akshai Puri for Azure Entertainment. It is an adaptation of Spanish Feature Film, THE INVISIBLE GUEST, which, at USD 41 mn, is the highest grossing Spanish Feature Film in China. The first schedule of the film began in Scotland in early June and majority of the film shooting was completed last week. This marks fourth collaboration of Sujoy Ghosh with Amitabh Bachchan and second film where Amitabh Bachchan and Taapsee are working together after the much-acclaimed PINK. Azure Entertainment, owned and promoted by The Three Sisters: Institutional Office (TTSIO), is a Mumbai based integrated Content Development and Production company. The Company has a dual approach towards Content Development comprising Acquisition of Foreign Language Remake Rights & Filming Rights to Books and a more organic approach on Original Content Development whereby it focuses on spectacular, big ideas. Azure has an active and an evolving development slate of between 6-8 properties at any given time. Azure’s development strategy is focused on positioning itself as the Content Company, which collaborates with Rights Owners around the World and Content Creators within India to forge win-win partnerships. Apart from the recently announced Two (2) Film Collaboration with Warner Brothers and Lionsgate to co-develop and co-produce remakes of coveted titles from their library, Azure’s current development slate includes a tie-up with Rodar y Rodar for The Body (Spanish), Atresmedia for The Invisible Guest (Spanish), a Three Film Remake Deal with Gaumont (French) including A Gang Story, Point Blank & The Brats, Quad for Heartbreaker (French), Nimbus for What Goes Around (Danish) and Filming Rights to Sushant Singh’s Mission Overseas (India) from where Operation Khukri is being developed. Apart from Badla, Azure is also producing Tigmanshu Dhulia's Yaara, Jeethu Joseph's Remake of Spanish Thriller, The Body and Kesari with Dharma Productions and Cape of Good Films.